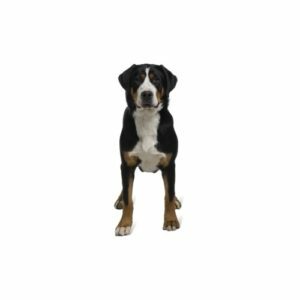 Large, sturdy and confident, the Greater Swiss Mountain Dog (GSMD or “Swissy”) is a draft and drover breed robust and agile enough to perform farm work in very mountainous regions. As a working dog, Swissies like having a job to do and enjoy participating in hiking, carting, obedience trials, herding, weight pulling, and backpacking with their owners. The breed’s short, dense coat is black with symmetrical rust and white markings.